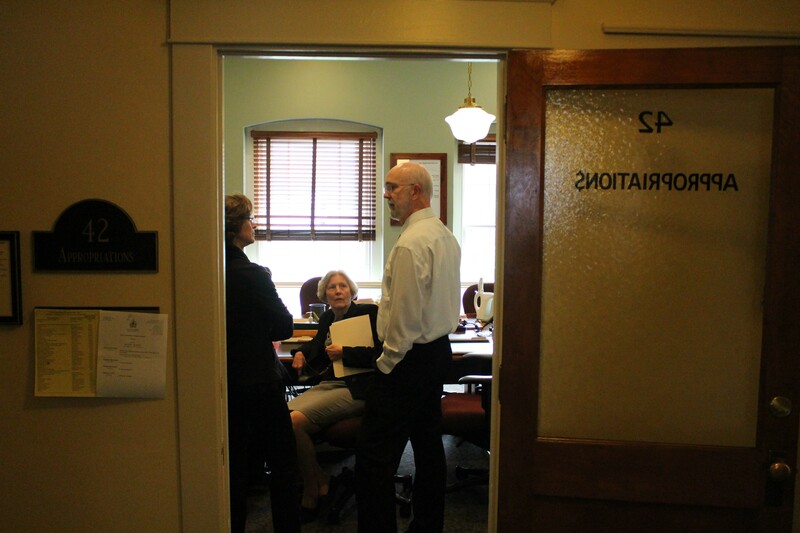 Half a day after legislative leaders threatened to send Gov. Peter Shumlin a tax package he would surely veto, all sides stepped back from the brink Saturday afternoon. 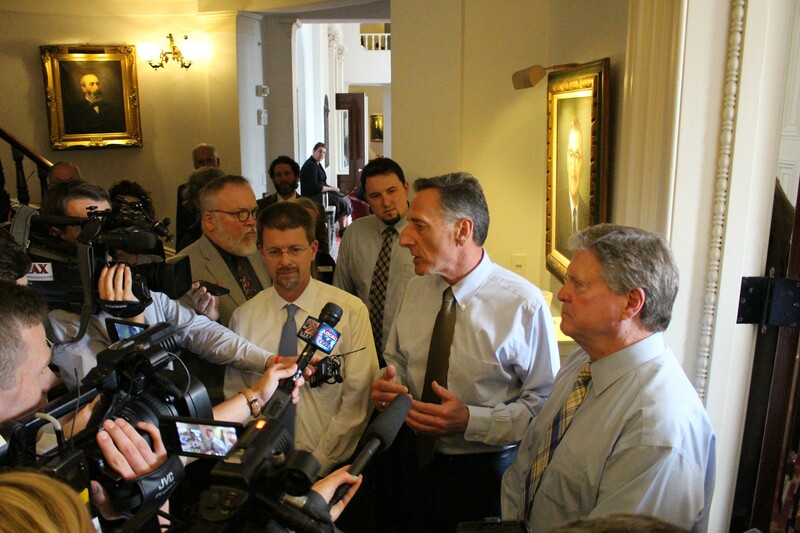 Shumlin, who was described by legislators as disengaged from negotiations Friday, spent Saturday morning working toward a compromise with House Speaker Shap Smith (D-Morristown) and Senate President Pro Tem John Campbell (D-Windsor). At 1:50 p.m., the three men emerged from the governor’s office to announce they’d reached a deal on a $30 million tax bill. Having struck a deal, the trio said they believed they could muster the votes for passage later Saturday and adjourn until next January. “I am confident that the bills will pass,” Smith said. “I think we can rally the votes — round up the troops,” Campbell echoed. “I’m willing to vote in either chamber if needed,” Shumlin joked. The Democratic leaders did not immediately describe the nature of the compromise, but details of the deal quickly spread through the Statehouse. 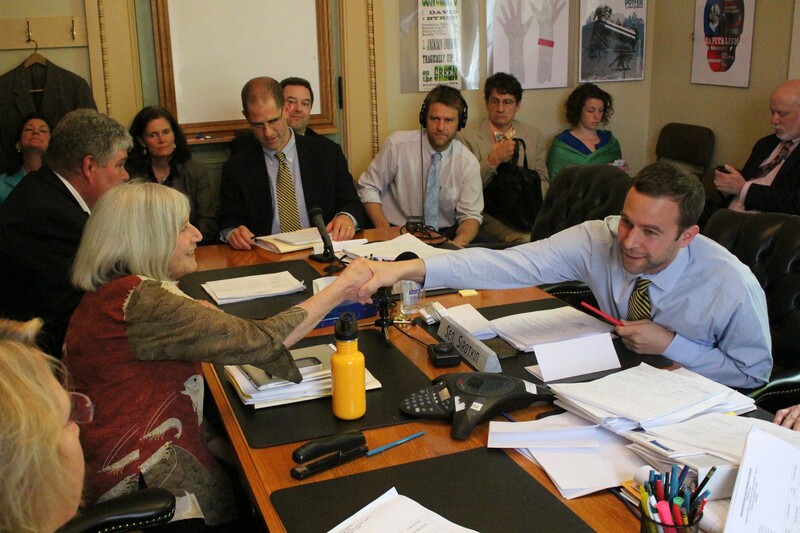 Rep. Janet Ancel and Sen. Tim Ashe shake hands after reaching agreement on a $30 million tax bill. The tax bill negotiated by House and Senate leaders late Friday remained largely unchanged Saturday afternoon. Instead of capping itemized deductions at two times the standard deduction, the new plan would cap them at 2.5 times. Charitable contributions and medical expenses would be excluded from the cap. In recent weeks, Shumlin strongly opposed any caps on itemized deductions and privately suggested he would veto any bill that included them. By agreeing to the deal, he appeared to back down from that stance. The tax bill, which was formally signed by a committee of conference just after 4 p.m., would close a loophole allowing the deduction of last year’s state and local taxes from the current year’s tax bill. Shumlin originally proposed that provision. The plan extends the 6 percent sales tax to soft drinks and the 9 percent rooms and meals tax to vending machine food. In addition to the tax package, the other final sticking point was a health care reform bill. Months ago, legislators panned Shumlin’s plan to raise $90 million through a new payroll tax to better reimburse medical providers who treat Medicaid patients. Since then, what started as a blockbuster health care bill has dwindled with every iteration. By Saturday afternoon, it amounted to just $3.3 million, funded by a 33-cent increase on the price of a pack of cigarettes — and an equivalent price hike on other tobacco products. Sen. Claire Ayer, Sen. Jane Kitchel and Rep. Bill Lippert discuss a diminished health care bill. Even as they signed off on the plan, leaders of the legislature’s two health care committees expressed disappointment with the end result. “It’s pathetic,” said Sen. Claire Ayer (D-Addison), who chairs the Senate Committee on Health and Welfare. The bill level-funds cost-sharing subsidies for low- and middle-income Vermonters who buy insurance on the state health exchange. It provides small rate increases to primary care providers and additional funding to the state’s Blueprint for Health program. “I wish there were other things we could include,” said Rep. Bill Lippert (D-Hinesburg), who chairs the House Committee on Health Care. Democrats, Republicans and Progressives alike appeared eager to finish their work in time to adjourn late Saturday. Republicans, who must agree to suspend the rules in order to immediately take up the deals, indicated they were willing to do so. The mood Saturday afternoon was a marked departure from late Friday night, when all sides appeared cruising for a veto fight. If Shumlin were to veto the budget or tax bills, legislators would have to return in a few weeks to see if they could override such a veto. House Republicans announced last week that they’d side with the governor if that came to pass. By Saturday, cooler heads had prevailed.